CinemaSins' "Movie Sins" series has been a hit with their dissections of a lot of bad movies, but I always enjoy when they tackle good movies. 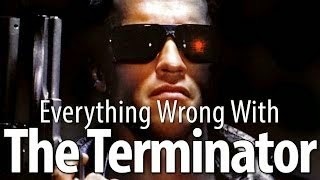 That's why I loved their take on The Terminator, unquestionably one of the great time travel movies of all time. No movie is perfect. For example, why the Terminator run away from the cops? And why did they report the murder of the other Sarah Connors so quickly? And if the time machine only works on living tissue, and the Terminator is living tissue covering metal, then wouldn't the Terminator end up as an empty bag of skin in the past? But if it worked, couldn't they have put some clothes and futuristic guns in a bag of skin? Okay, those last two were mine. What did you think of The Terminator? Think I'll just keep my memories intact on this one. Yeah really why not just build some weapons inside the Terminator? I guess they did that in the 3rd one. Good find. I'm watching...well...listening while I type.